The 7,400-acre Badger property lies less than an hour away from the University of Wisconsin campus. Over the years, many UW faculty have taken a keen interest in Badger, recognizing the opportunity to introduce their students to this magnificent landscape rich in cultural and natural history, and to undertake original research on diverse aspects of land reclamation, restoration, large-scale management and other topics. The Alliance has a long history of encouraging and facilitating research at Badger. A number of research projects and graduate-level theses have been completed at Badger. Visit the Badger Archive for samples of studies completed at Badger. Several research projects are currently supported by the Alliance, including one on goats (yes, goats!) and one on apples (yes, apples!). Cherrie Nolden, a local farmer and graduate student at UW-Madison, has routinely brought a herd of goats to Badger to help control invasive shrubs. As it turns out, goats LOVE some of the more intrusive species, including honeysuckle, autumn and Russian olive, prickly ash, multiflora rose, and others. Goats are efficient browsers, mowing their paddock to stubble in just 24 hours, leaving behind nutrients to help nourish the soil, thereby making them not only excellent multi-purpose farm animals, but restoration specialists as well! Cherrie is currently conducting a study to test the viability of long-term browsing on invasive plants at Badger. Her research will eventually lead to her PhD degree. For several years, a team of apple enthusiasts –the “Apple Corps”–has carefully mapped and labeled heirloom apple trees on what were once vibrant working farms before the Army took over the land. 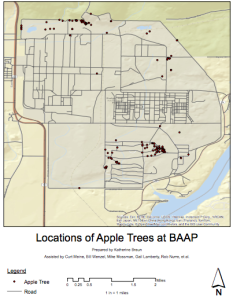 Our volunteer Apple Corps is partnering with UW-Madison graduate student and Alliance Board member, Katherine Braun to locate, care for, and connect with pre-WWII farm families and the numerous (now very old!) apple trees that span the Badger property. 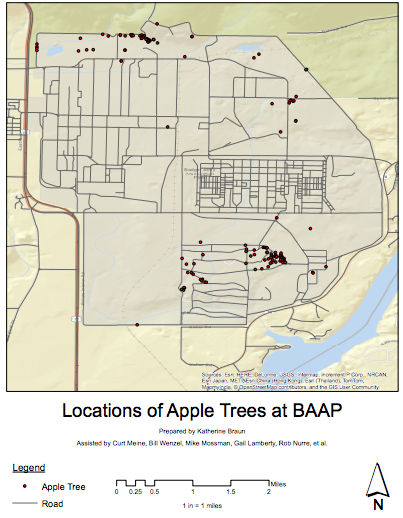 In spring of 2014, the Apple Corps marked a total of 147 trees and this marking continues. These trees are among the few remaining “structures” at Badger that pre-date the Army ammunition plant, and they represent a slice of Sauk Prairie farm life dating back more than 70 years. See the Badger apple tree map (right). UW-Madison Nelson Institute faculty and students have partnered with the Alliance to develop a system of monitoring invasive plants at a priority restoration site (Hillside Prairie at Badger) each year. This type of monitoring is critical for assessing the success of ongoing restoration efforts. Given limited resources, one way to obtain this necessary data is with volunteer citizen scientists. Volunteers learn how to identify several invasive plant species, gain experience in vegetation sampling, and contribute to our long-term stewardship of this important prairie remnant.